Last week we basically lived in our car because our home remodel was so loud. We usually went to one park at 8am, another park at 11am, then out to lunch, and then off to another park after my son was done with school. The weather was gorgeous, so our adventures were awesome, but we didn't get nearly enough time for crafts & projects at home. Oh well! :) I got lots of time lounging and kissing the baby's big cheeks while my toddler played in our kiddie pool (rough life, right?). When we were home, we tried out a few crafts and activities by some of our favorite bloggers that I am excited to share with you! We started off the week with Painted Water Color Coffee Filter Flowers via Inspired-Housewife. My kids weren't as interested in putting as much color as the ones we were trying out, but they still had fun. They always seem to want to paint with just black though which makes all the other colors mucky, so I have just started popping the black out of the watercolor sets before they start painting. 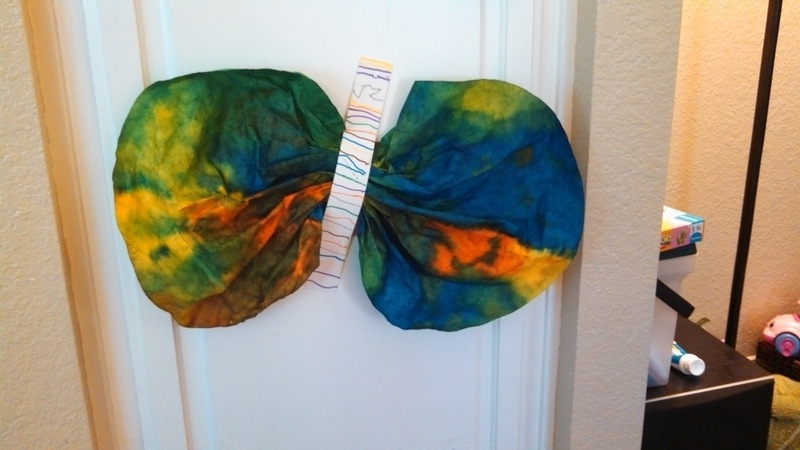 My son made this ginormous butterfly at school using liquid watercolors that I also loved. I am adding liquid watercolors to my "must buy" list! (The brand I linked to is the one my son's teacher suggested.) The colors are awesome! I was inspired by this Floral Button Picture via Folksy so we decided to grab some lids and buttons and make our own recycled lid flower crafts. I shared our creations over at Life Your Way last week. They make our kitchen feel so springy and colorful! We also did a lot of goofing around and RHYMING! Making up rhymes and discovering rhyming words is a favorite activity at our house right now. My 5 year old loves to rhyme with inappropriate words (awesome ;)), but also finds rhyming words as we do every day activities. He definitely found some rhyming words as we did some baking together on "Take Your Kids to Work Day. " 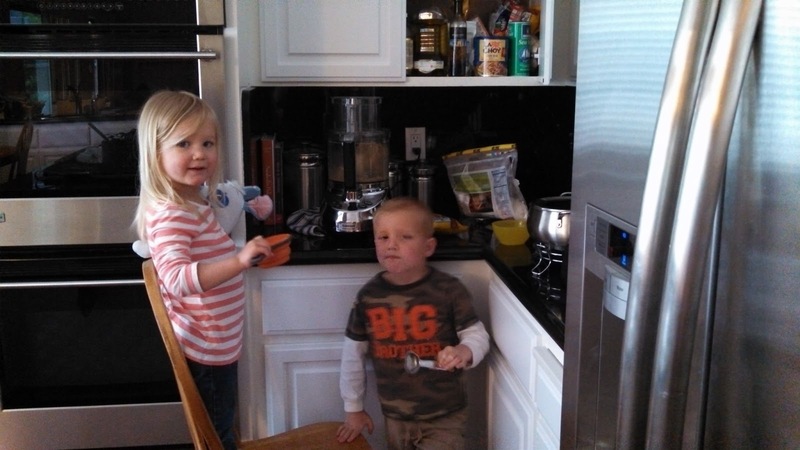 I showed the kids my favorite mom-work activities (baking, crafting, and playing with them!). 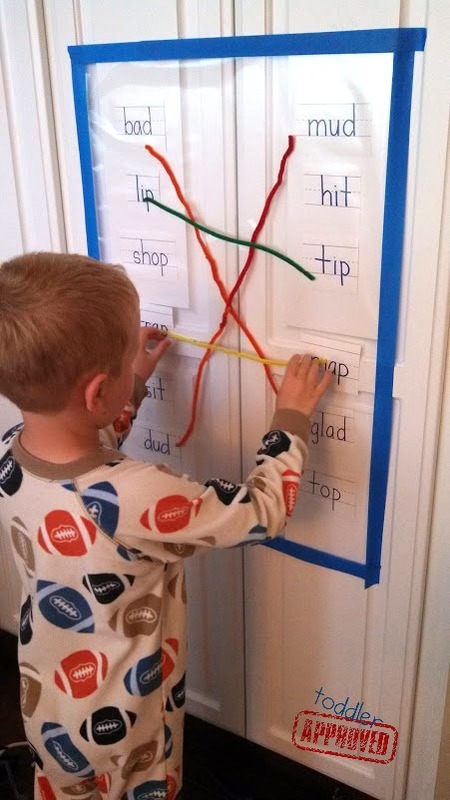 We also tried out No Time for Flashcard's Rhyming Peg Board activity and then we invented our own giant Pipe Cleaner Rhyming Sticky wall. We never got to do Truffula Tree Math games or Math in the Bath, so those are on our "to do" list for next week. Next week we are going Screen Free during the day! Sometimes my kids get to watch a show or two while I feed the baby, shower, make dinner, or clean up... so this week I will need to rely less on my DVD helper and we will need to be even more creative. What is a book that you read every day? Did you try out any awesome activities last week? Which ones? Come tell me about how it went in the comments. By the way, did you enter our awesome children's book giveaway yet and sign the Say No to Bullying Pledge? There is only ONE day left! Hurry over! Thanks so much for sharing the link to my Colors and Shapes sidewalk chalk activity! I hope you guys had a really fun week!